Panopto offers two ways to download recordings, and creators control the settings for both of them. By default, all downloads are now turned off. One download mode allows viewers to download individual recordings through Canvas or Panopto. Creators may specify who, if anyone, can download recordings. See the first procedure below to learn how to turn on downloads. The other mode is available through the RSS/podcast subscription. Once someone subscribes, each new lecture automatically downloads when iTunes syncs. The RSS link can be shared by students with others who are not enrolled in your course. 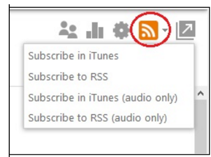 See the second procedure below to learn how to turn on RSS feeds and podcast downloads. You may specify who, if anyone, can download individual recordings. Open a folder in Panopto. In the upper right corner, select the gear icon. 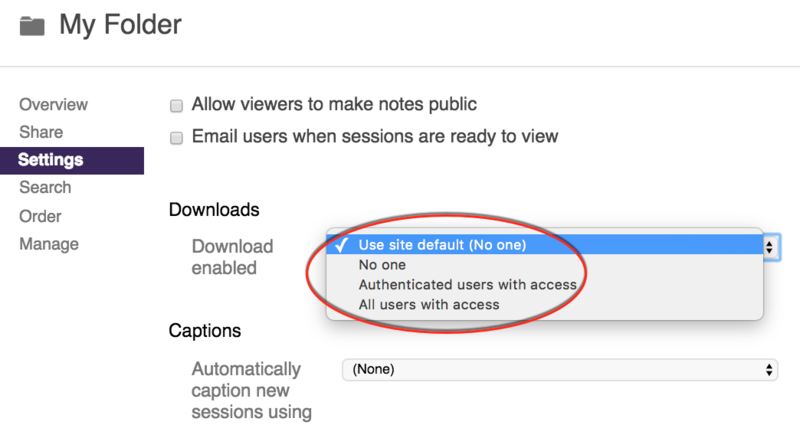 In the folder downloads setting, select no one, authenticated users with access, or all users with access. Selecting no one prevents users from downloading individual recordings (unless you have turned on podcast and RSS feeds — see following procedure). Selecting authenticated users gives your enrolled students and others that you have shared the folder with access to the recordings in the folder. Selecting all users with access gives anyone who has the link access to the recordings in the folder; no sign-in is required for access. Specified viewers will be able to download each individual recording.For students, a download arrow appears above the recording. Open your folder in Panopto. In the upper right corner, select the gear icon. Click Settings and then select the Enable Podcast Feed check box. The RSS feed and podcasts are now available. However, note that it sometimes takes a few minutes for the setting changes to appear in Panopto. For viewers, the RSS icon appears in the folder in Canvas and Panopto. Viewers may subscribe to video podcast recordings or the audio-only podcast recordings. Note: The Enable Podcast feed setting is not available in “My Folder”, but it is available in subfolders of My Folder.